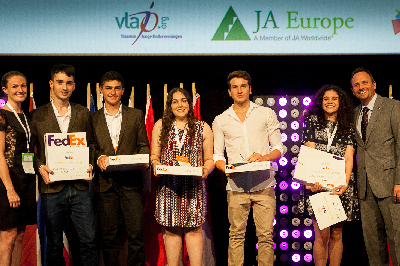 At the beginning of this academic year, FedEx Express extended its support for the Company Programme to include sponsorship of national Company of the Year Competitions via JA companies in the UK, France, Italy, Spain, Poland, Germany and Belgium, which will host two competitions for its French and Flemish speaking students. The deepening of FedEx financial support comes as part of its social responsibility program FedEx Cares. Launched in 2016, this community investment strategy pledged to invest $200 million USD in 200 communities by the year 2020 with the aim of connecting people and possibilities – something FedEx Express does physically in its day to day business and is committed to doing socially through relationships non-profit organisations like JA Europe. Through its sponsorship, and the takedown of its signature FedEx Access Award to national competitions, FedEx Express encourages young entrepreneurs to further develop their business ideas with Access front of mind. A panel of FedEx experts will award the FedEx Access Award to the student-company that best demonstrates innovation, readiness to access new markets, positive socio-economic impact, and environmental and social responsibility. FedEx Express support for JA Europe, but has enabled JA Europe to make the Company Programme more accessible to young people in the region. Each year, over 350 000 students participate in the JA Company Programme. Winning teams, chosen at national competitions in up to 40 countries, are invited to compete at the European final of the Company of the Year Competition, taking place this July in Serbia. There, FedEx Express aims to inspire and empower the most promising young entrepreneurs with the principles and benefits of global connectivity. Keep an eye out this July for news of the student-company rewarded by the logistics giant for thinking globally and planning for responsible, international business growth.